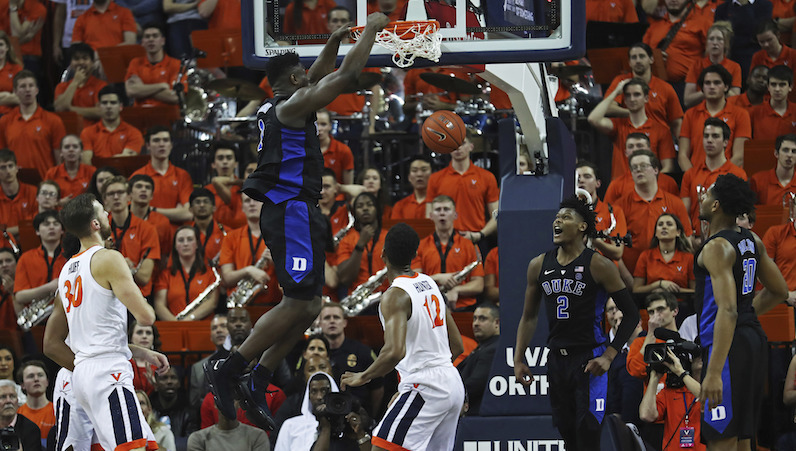 Zack Wajsgras/AP Photo Duke's forward Zion Williamson (1) dunks the ball in the second half at John Paul Jones Arena on Saturday. Duke held a lead throughout the second half to close out a 81-71 win over the Cavaliers. This week’s AP Top 25 Poll is out, and it features six ACC teams — led by No. 2 Duke. Tennessee once again claimed the top spot even after Duke’s road win at Virginia. Three ACC teams land inside the top 10. Virginia drops just one spot after the Saturday night loss; elsewhere, Virginia Tech fell 11 spots after defeats to Louisville and Clemson — without Justin Robinson. NC State, once again, received no votes in the poll. Only one other ACC team received a vote: Clemson (1).